It’s that time again…time for 30+ days of delicious & inspiring burgers for you to drool over delivered by 30+ fabulous food blogers! You better stock up on napkins! My friend Kita (hard-core food blogger, pod caster, comic book master and cat-herder extraordinaire) from Girl Carnivore has once again worked her magic to deliver great burgers, fabulous sponsors and fun prizes to make this the best #BurgerMonth yet! A peek at the first 7: Visit Girl Carnivore for the links to these burgers or follow #BurgerMonth via social media to find them all! Not only are we hoping to inspire you to get-your-burger-on…we have awesome prizes too! Woot!! I tinkered with posting a shrimp burger, but decided that going the chicken route might be a better all-around crowd-pleaser, since…I just don’r know how it’s possible…but some people don’t like (gasp!) or can’t eat shrimp! I wasn’t sure if everything I wanted to add to the burger would work…but you know what? I did! You know I like heat, right? 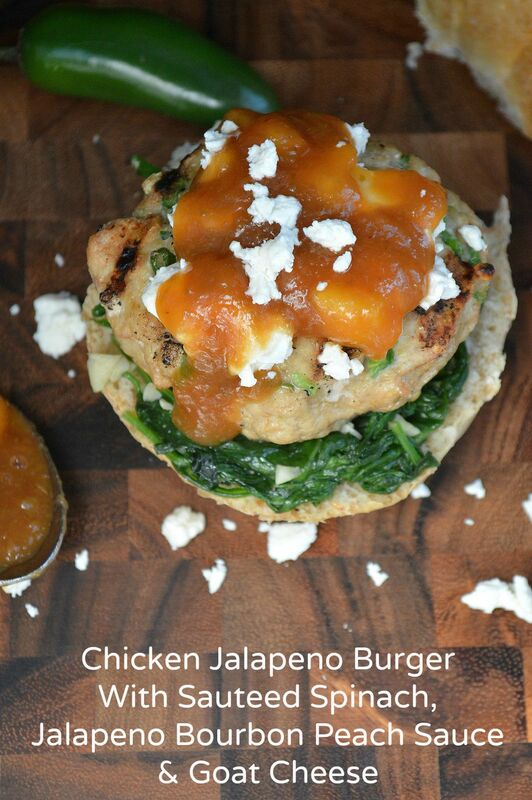 I went with making a simple Jalapeno Chicken Burger. I wanted to nestle it atop some sauteed spinach. I wanted to include goat cheese and I wanted peaches to have something to do with it. So, I made a Jalapeno Peach Sauce with a splash of Bourbon! The result was a delicious burger, that was satisfying yet not overindulgent. Everything worked together. It was moist, full of flavor and and all around winner. Even my husband, who detests cooked fruit, any cooked fruit, other than an apple pie (groan) and who hates goat cheese…Loved it! He couldn’t get over the flavor of it. Score one for me AND cooked fruit!! Whoop! If you are looking for something different in a burger…this is it! Combine the ground chicken, jalapenos, scallion, cumin, salt, pepper & onion salt in a mixing bowl. Handle it as little as possible. Just enough to mix the ingredients and form 3-4 burgers. Oil and preheat your grill. Combine all ingredients in a small pot or saucepan except for ⅓ cup of the diced peaches. Bring mixture to a boil, lower to a simmer for 12-15 minutes until thickened, stirring often. Remove from heat, add in reserved diced peaces and set aside. 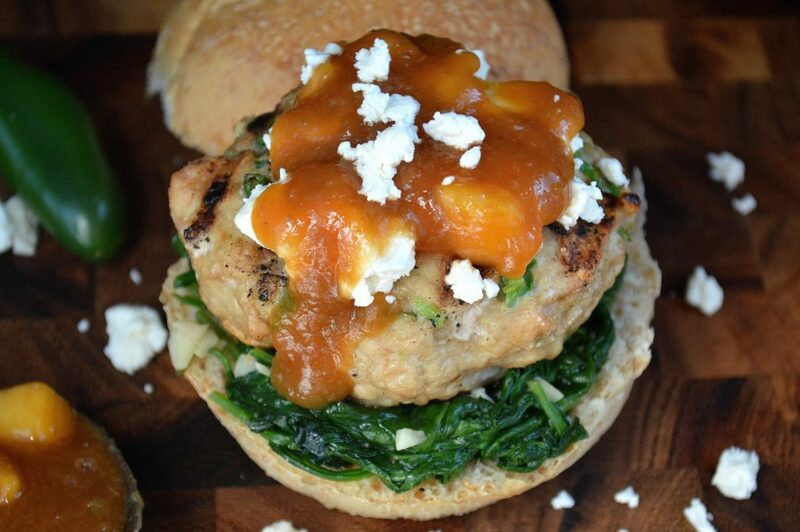 When ready to assemble the burgers, add sauteed spinach to your bun, top with a burger, top the burger with some goat cheese, top the cheese with the peach sauce and serve! To make sauteed spinach, heat 3 TBS grapeseed or olive oil in a large skillet, add in 4 cloves of garlic minced, sautee for 1 minute. Add in 1 pound of fresh spinach leaves. Keep tossing the spinach in the oil until spinach wilts and reduces. season liberally with salt & pepper. Remove from heat when all spinach has wilted (about 4-5 minutes of cook time total). A huge thank you to all of the creative bloggers and their inspiring recipes, to Kita for once again organizing this and to the awesome companies that donated prizes to #BurgerMonth! 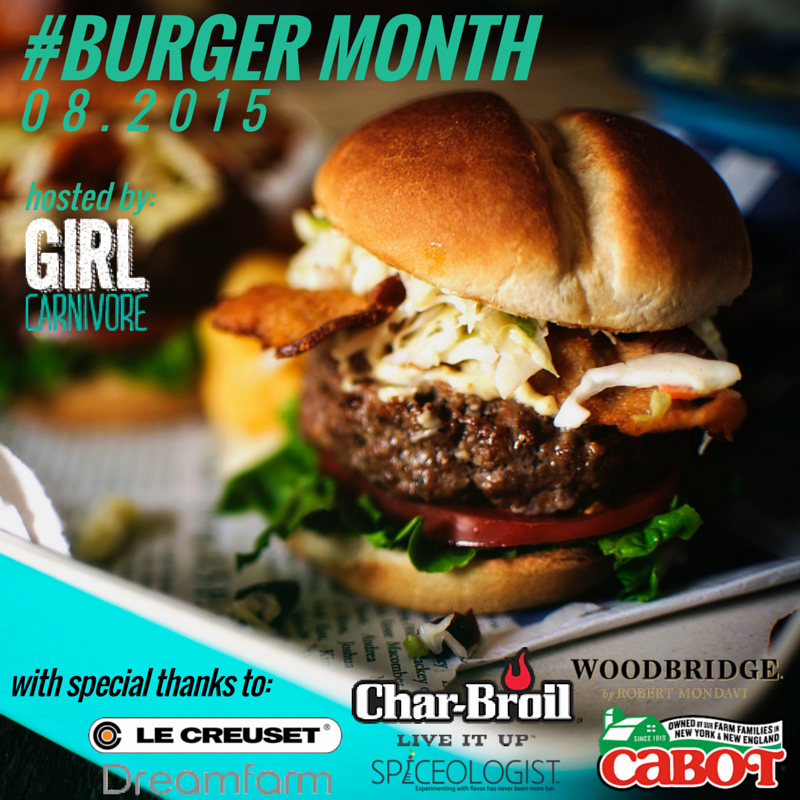 Char-Broil, Cabot Cheese, Le Creuset, Dreamfarm,Spiceologist & Woodbridge Wines You guys rock! 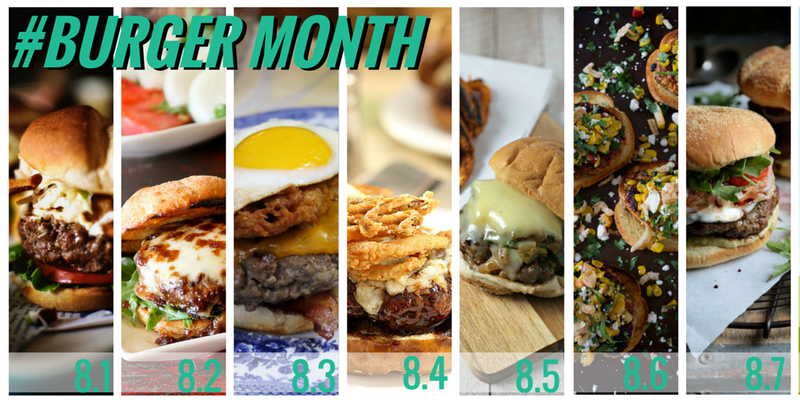 This post is part of the #burgermonth celebration happening all month long across the interwebs with 30 other talented bloggers!! Be sure to follow #BurgerMonth to check them all out and don’t forget your napkins…you’ve got a lil’ something on your chin! I like my burgers topped with sun dried tomatoes, banana peppers, caramelized onions, arugula, fresh mozzarella and garlic/basil aioli. I’ve also had a burger Elvis style that I liked…Peanut butter, bacon and caramelized bananas. The first sounds amazing! I have to say…I have never come across banana peppers on a burger. Now I WANT to! The second…ummm I just can’t wrap my head around the PB, lol! My special burger is actual a LAMB-Burgerr, I’d call it a Greek or Mediterranean Lamb Burger really. I mix the ground lamb with minced (pulsed in food processor) pitted Kalamata olives, chopped garlic, and Greek seasonings, a dash of cinnamon and lots of crumbled Feta cheese.before forming the patties. These flavorful burgers are delicious as is or topped with a slice of tomato and maybe a yogurt-garlic- dill (or mint) cucumber sauce (or like a tzatziki sauce. SO good. Your Lamb Burger sounds SO delicious!! I have had my mind on a lamb burger for a couple of years…now I HAVE to make it! Love that you pit cheese IN it…I am so going to try this out! Thanks! Thanks Colleen ~ you’ll love it! The meat is so much more flavorful than ground beef! I’m more of a traditionalist…I do add a lot of seasonings to my burgers, garlic, and onion powder, bread crumbs, egg, salt and worchestershire sauce; and I love them with American cheese, fresh tomato, and onion! Great giveaway, thanks! My ultimate burger creation: Beef burger, onion rings, lettuce, tomato and ranch dressing. Yum! An epic burger needs a thick-sliced Jersey tomato, caramelized onions, homemade sriracha ketchup, a thin smear of Maine Maple Champagne mustard on the bun, and a buttery lettuce leaf. Yum! Woot! for Jersey tomatoes! That mustard sounds delicious…just looked it up and now I’ll hunt it down, thanks!. A restaurant where I used to live made a burger topped with blue cheese and dried cranberries. Sounds odd, but it was surprisingly delicious. Ooooh, I LOVE dried cranberries! I’d do it with goat cheese! I’ve never gotten a taste for blue cheese…yet!